Beautiful wooded lots with central water and sewer only blocks from a pristine mountain lake and 18 hole golf course. Paved roads, flat and 5 only minutes from the New Jersey border and about 12 minutes to the bus to New York City. 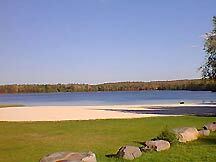 These are the best homesites in the Poconos. They are perfectly wooded with mature trees. Prices range from $69,900 and include access to central water and sewer. Consider buying now and building later to lock in the cost of the land. Financing available through local banks. USA Realty's Land Division takes pride in bringing our customers the highest quality, Poconos land for sale. We understand what you're looking for in a permanent residence, weekend retreat, vacation spot or retirement paradise and we take the work out of locating the perfect spot. Come visit us in the nearby Poconos Mountains and see what sets us apart. We pride ourselves in offering Mountain land, waterfront communities and lake communities near New Jersey and New York. Most lots are within 10 minutes of the New Jersey border and less than 1 hour and 30 minutes of New York City.